Hello world, I'm back in Taiwan! After a great Germany trip I am back here in Taipei where my second semester of Chinese study at Shida University already has begun! I arrived here in Taipei on sunday night at 11pm and was sitting in my classroom monday morning at 8am. I absolutely didn't want to miss another day since I had already missed the whole first week. For the 2nd semester I have a new strategy. First semester was already very successful, but in the end of the first semester when it came to the test I found out that I had not really studied at home after class which meant that I was not so well prepared for the test at all. This semester I will change that. Directly after my class at 10am in the morning, I will directly go to the library and sit down for at least one hour to study on my own. Did it these first two days and it was really nice. In the first sem I just went to Taida directly after my Chinese course and did nothing but surf the web and wait for lunch, that time will be spent much better in this semester! 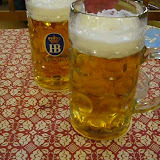 Oh yeah, and there was lots of beer when we visited the world's beer capital... MUNICH! ...has it really been 2 months already? I can't believe it. You know, the time goes by so fast, I already see myself sitting in front of my computer and writing a blog post with the subject "My first 2 years at Shida..." ! This whole thing is soo enjoyable! I don't want it to be over so fast! What to do?? Hm, well, what about just staying here in Taiwan and not going back, taking every single course that Shida has to offer, until they will tell me: "Sorry, Sebastian. It is REALLY time to move on, you have taken every course we offer, there is nothing more to learn!! GO HOME!!! THERE IS A LIFE OUTSIDE OF SHIDA WAITING FOR YOU!!!!!!" So what about my Chinese? Did those 2 months at Shida really make a difference for my spoken Chinese? And also I might say: yes. I made a lot of progress in those 2 months. Especially in my spoken Chinese. The motivation throughout these 2 months always stayed high, because of the fun that we all had in class. I mention it in nearly every post here, just because that never gets old for me. It is one of the best things to directly practice the new vocabulary and sentence structures with your new friends that can just communicate with you in Chinese and not in English. Go for a class with Asians if you are a westerner. Find a class that doesn't have people from your homecountry or that has few or no people that are willing to speak your native language with you! This will force you to really speak Chinese, also in the breaks and I love to do that. That's why my spoken Chinese really improved. My teacher is a motivational factor as well for sure. I had very good luck that I got her as my teacher and we all think like that. For the next semester we will ask the school to keep her and the class at it is now. You can keep your teacher and the same people if you find 8 ppl who share this wish and the teacher also signs this form. We will do it! So now, you might be interested in how I use Chinese in my everyday life here. A good example that shows that I really dare to use it out in the streets: I found myself arguing with a waitress in an Italian restaurant here. No, didn't use Italian (which I cannot speak) but Chinese! The service really sucked and I had to release my anger and frustration. And I did that in Chinese. Wow that was interesting. Haha! AND? Yeah, didn't have to pay the 10% service charge because of my outburst of fury. It must have been super funny though. An angry Germany guy in an Italian restaurant in Taiwan furiously scolding a waitress in Chinese...haha! Okay, looking forward for the last month of my first semester at Shida! The Motorola Ming ! 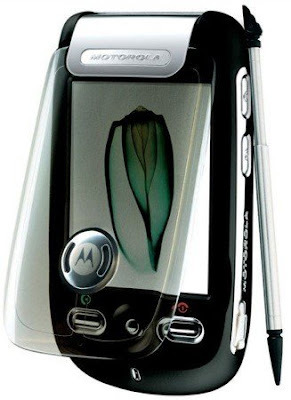 This is my first Motorola Cellphone and I love it! Well, the design speaks for itself, it is just awesome. But it's functions really gave me no other chance but to buy it. It is small compared to other smartphones but still has all the PDA functions you would need. Calendar, Tasklist, Notes, Contacts, Email and so on and so forth. Of course you can synch all that to your Outlook over bluetooth or a standard USB cable. Nice. It also comes with MSN pre-installed, so you could chat with your buddies on the go as well. Of course it can playback MP3 and videos with its build in real player. But what made it really appeal to me is its Chinese-English dictionary with handwriting recognition function. And it works like a charm. Whenever I see a character that I cannot read now, I just write it onto the big display and the phone will recognize it and directly give me the translation. Sweeet!! I love it. And the price is also very good! You can get it at NOVA next to Taipei Main station for just 9000 NTD, without a contract! That is really a good price for this smartphone. If you get it with a contract, I have even seen it for 3000+ NTD (Taiwan Da Ge Da). Okay, I can't write more now, have to play with my Moto Ming..
You also have a Wii ??? I didn't have class today and there also won't be class at Shida the rest of the week. It is spring break time! :) Normally I should be happy about that, but when the teacher told us on monday, I felt kind of sad...haha! I think that is the first time in my life that I feel like that about a school holiday, unbelievable! And believe me, that is really a very good system to remember the tones! It is so much easier to remember that a character was in the blue stack and therefore must be 3rd tone than just to remember something abstract like "3rd tone" on its own. I better visualize the character on its blue card. Works fine for me. Why did I choose those colors? Well, I like the 4th tone, therefore it's green (GO!). And I don't like the 2nd so much, hard to speak for me, so it became red (ATTENTION!!). :) The other colors are more or less randomly chosen. You could choose different colors for your flashcards though...haha! Here is a colored flashcard's front. It just shows the character, and if there is a simplified version of it, I also put it on the right bottom corner. Might be useful sometime to also know about them. On the back of the card, there is the pronounciation of the character and the most important words for which this character is used. I try to learn them all. I use www.zhongwen.com to find all the different meanings. The stacks don't have a special order. Actually I shuffle them from time to time, so that I don't just remember them because I know their sequence by heart already. The two white stacks have the following purpose. One of the stack is my blank stack. It contains some blank cards, and whenever I want to say something but I don't know how to say it, I will write it down and the next Chinese speaking person that doesn't run fast enough will be interrogated. Most of the time that is my friend Curis or my girlfriend. Thanks for helping me so much! The other stack is just normal English to Chinese vocab. I will read the English vocabulary and will try to remember what is the Chinese expression for that. This is how I study the new vocabulary of my Chinese book. This taking videos idea was really good I think :) Ahhhh, I really love to study Chinese, damn!!! It is GREAT and highly recommended. What a great time I have here in Taiwan, fantastic! You might think that you are at the Bureau of Consular Affairs of Taiwan, but actually you just stepped into the front court of hell. You will have to come here to apply for a resident visa that will allow you to stay for more than 6 months. After you have studied Chinese for 4 months at Shida (or any other officially recognized Chinese Language schools) you are entitled to apply for such a visa. And believe me, those poeple at BOCA will try anything to give you a hard time and make it difficult for you to get this VISA. You are Westerner? Oh good luck for you! Makes it a whole lot easier! Still you will be treated unfriendly, but at least you will get your VISA without much trouble. In my case that was different, but I will come to that later. You come from South East Asia, let's say Indonesia, Vietnam or the Phillipines? REALLY bad luck, most likely you will be treated like a criminal, called in for face-to-face interrogations, ridiculed and laughed at. And it is really as bad as it sounds. I made good friends with an Indonesian girl in my Chinese class and what she told me about her experiences with BOCA disgusted me. In the beginning of this week she was called by one of their officers and told that she had to come to BOCA for an interview at exactly 2 o'clock at the same day. No matter what she had to do that day, she had to come. I have never heard that this had happened to a Westerner before, and it also didn't happen to me. Anyways, she went there and was interrogated for more than half an hour. And I use the term "interrogate" here on purpose, because as she told me, she felt like a criminal that was interrogated by the police. One of the first questions was were she came from. And once she said "Indonesia", the female officer couldn't help but laugh out loud while obviously making derogative comments to her officer friend that was also in the "interrogation room". Oh, of course the whole interrogation took place in Chinese language. And my Indonesian friend is in my class so our Chinese is around the same level. Of course our Chinese is not perfect since we are still beginners. So now what is really sad: whenever she made a mistake speaking Chinese, the officers would make fun of it and laugh at her face. How sad is that? It is a shame for Taiwan, I have to say. There is a young girl that is interested in the Chinese language and culture and wants to learn more about it with coming to Taiwan. She is even thinking about becoming a Chinese language teacher in the future, because she wants to spread that culture in her home country. And now THIS happens, some BOCA officers treat her like a criminal and ridicule her? I can really understand that she doesn't like Taiwan anymore. Then she was asked what she planned to do after her Chinese studies in Taiwan. She answered that she wants to become a Chinese teacher later. And what did the officers answer? "Why do all Indonesians want to become Chinese teachers?". I don't want to comment on that, it is just too stupid. Well anyways, later she had to answer questions like how much money she brought into Taiwan, and why she has so and so much money on her account and so forth, obviously trying to imply that she would work illegally here, what she does not do. Then they asked her why she didn't attend class for 5 days last month. Well, she had to fly back to Indonesia to change her Visa because they refused to extend it, that's why she obviously couldn't attend class. She clearly explained it to the officer but now the officer told her that she couldn't understand her bad Chinese. She gave her a piece of paper and told her to write down the reason again, in *good* Chinese so she could understand it. I have to repeat myself again, this is a shame for Taiwan. If that happened in a German government office and it became public, the officer would have to face *severe* consequences. But here this doesn't seem to be the case. Unfortunately, this case doesn't seem to be an exception - discrimination of people from Southeast Asia seems to be the everyday routine for the BOCA. Well, Taiwan wants to be recognized by the world as a democratic and modern country? Hm, that is not quite the way to achieve it. Especially in these days where word spreads so fast and the bloggosphere is so powerful. This has to be made public, perhaps they will change their behaviour when they find a blog entry like this being the nr. 1 search result on google when you enter "Boca Taiwan". Well, you can help by linking this article in your own blog. It is worth a try. So now this has already been a long posting and I didn't tell you about my personal experience with BOCA and I won't do it for now. It would go beyond the scope of a single posting. I can just tell you that this was my single and only really negative Taiwan experience so far. I have come to love the country and its friendly people, so it is just sad to see that a single office can spoil some people's Taiwan experience. P.S. : Just to mention it: I did get my Visa after a long struggle. Thank god I am German and not Indonesian or Vietnamese! When I told him that I can understand all that, but the main problem would be *how* my classmate was treated and that she was laughed at and ridiculed and that the whole attitude is not professional, but what is worse, does not respect human rights at all, there was not much of a reply. However, he did say that they want to improve and seriously consider some of the "suggestions" that I made, as he called it. What I found negative is that the boss of the Visa section that I talked to asked me to delete my original posting since it would "hurt Taiwan". I directly told him that it is not my posting that hurts Taiwan, but more the fact how his office treats people from South East Asia and that I would not delete the article but edit it and include his standpoint, what I did. I am sure he reads this, so I would invite him to directly reply or comment on the accusations that were reported by my Indonesian classmate. He could tell us what his opinion is on the way that his officers treated that girl and if he will draw any consequences from that behaviour of his officers. My email address can be found here on the website and for sure I would put his reply here. Third week of class at Shida is over, 4th week to beging tomorrow. Oh my god, didn't I just write about the placement test and stuff?! Crazy! As mentioned before we started with the 2nd book last week. Instruction has also changed with that book. In the first book we talked about every single new word in the vocabulary and would have it written on the black board. Now we just quickly rushed through the vocabulary section of the first chapter and our teacher asked us to learn the new words at home. I like that approach much more than spending a lot of time in class for looking at the new vocab and trying to remember it directly in class. From what I can tell for now the second book is really more challenging than the first one. We just went through the first chapter but that already has a huge grammar section that introduces a lot of new sentence structures. Pace of class is still okay, if not a little too slow for my taste. But I guess that is due to the number of students in class. I feel that 9 students is really not the optimal size of a class. And if I had to criticize one thing of the Shida Chinese course, it would be just that. But as I also mentioned before, Shida offered us to change classes but nobody wanted to do so. Well...our own fault then. 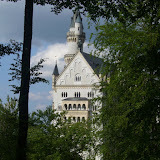 Learn to live like a German! First of all, as you can clearly see it is in Chinese language. So it is already worth to mention here. ;) But what really stands out is the book's contents! The book's contents motivate me much more than the afore mentioned "Alchemist" to be able to read a Chinese book. Haha, I am still fascinated! The title of the book is "學德國人過生活" which could be translated as "Learn to live like a German"! Oh yeah! Germans enjoy a very good reputation here in Taiwan. But I never expected it to be soo good that they would even have a book about how great we Germans are! So all you guys out there who want to lead a better, more successful life and are able to read Chinese: get this book! It is highly recommended. 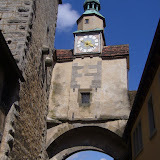 Find out why we Germans are so much more than beer drinking, bread eating perfectionists that are always on time and love drive our Mercedes-Benz on the Autobahn (at breath taking speeds, I might add). My girlfriend told me that she will happily read every single page and find out if everything is true. Until today, most stereotypes described in this book actually did apply, haha! And we are not talking about the beer section here. That withoubt doubt is true for sure. Tomorrow we will start with the 2nd book! My first impression after I opened the book was: oh my god, were did all the latin characters go? 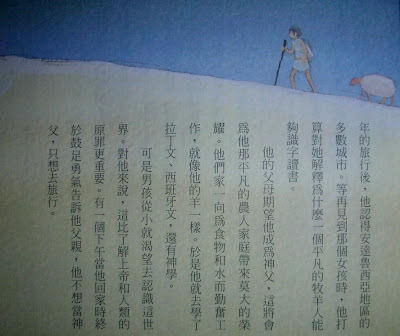 In the first book all the chapters had all the texts in the romanized version (Hanyu Pinyin) as well. But actually I never used it anyways, so I won't miss it. Other than that, the book feels more like written for grown ups. The first book was full of little cartoons and drawings. Nothing like that in the second book which instead has much more photographs. Also the texts are much longer. They seem to mean business, too! LLLEEEEEEEET'S GET REAAADYYY TO RUUUUUMMBBLLLE! Let me tell you again what makes this so enjoyable for me, apart from learning the language. It is the FUN that we have in class. So much fun, I cannot emphasize it often enough. These two hours are the most enjoyable of the day for me. Okay, actually I also like the hour I spend with having food, but anyways, you know what I am talking about. ;) It feels so great to learn this language with people from all over the world that you like more and more each day, trying to make jokes in Chinese, laughing about the inability to express certain contexts clearly, but still trying to do so using the most basic vocabulary and just enjoying to be all in the same boat. Room Nr. 926, Shida University, Taipei, Taiwan. I will never forget this time I have here. today I finished my second week of Chinese language class at Shida University. Wow, how the time flies! In the first week I was just so overwhelmed by all the new impressions. Now that the class more and more becomes a daily routine, I can have a more objective look at it and tell you about it. What still is great about the class: lots of lots of talking! We are speaking Chinese all the time, and we are being encouraged to do so. While having those conversations we always pick up new vocabulary that is REALLY useful and not in the books. What will certainly get much better is my vocabulary and what comes with that is my ability to express myself in Chinese. On the other hand, writing does not seem to be so important for my teacher. When I compare this class to my class back in Singapore, that is totally different. In Singapore, we had a dictation every class and so everybody was kind of forced to study all the characters so well that we would be able to write them. In here, it is not so much about writing but much more about recognizing the characters and being able to read them instead of being able to write them. My Chinese speaking has improved for sure, but I cannot say the same about my writing skills. Well, for me that is okay, since I also care much more about the speaking skills! But for people who are more into (hand)writing Chinese, and cannot motivate themselves to study on their owns at home, that might be a little issue since you won't be forced to write all the time. Now we are 9 students in the class. That is because some students changed their class to mine. With 6 students as before, it was much better. Well, they offered us to change to another class that just has like 4 students, but nobody whished to do so, for sure because our teacher is so good. So you see, there are also some drawbacks of having such a good teacher! From time to time I will record me speaking Chinese and post it here. For your entertainment (lol) and for me hopefully seeing some progress and motivating myself. Today I finished my first week of Chinese at Shida University. In this posting I want to tell you a bit about the pace of the class and about how the the teacher holds the class in general. My first impressions of my language course at Shida are still very very good. Actually I am a bit sad that it is friday by now and I have to wait two whole days until I have class again. Really sounds like a "Streber", thats how we call it in German. I guess in English that would be "geek", but I am not too sure about that. Those guys at highschool that REALLY do their homeworks and happily present it to the teacher after class, if they had no chance to present it in class...haha! Okay, about the pace of the class. I had four sessions now, from tuesday to friday. And in these sessions we covered exactly one chapter, which was chapter 23, pages 429 - 449. So the pace is for sure not too fast. Since I had already worked through the book myself and therefore knew about the words and the grammar, I had the feeling that we were even moving a bit too slow. But I guess that was just my perception because I had already worked through that chapter. If everything was new for me, I guess the pace would just have been right. We will see when we start with the second book soon. Our teacher started out with the vocabulary. But not the whole set. She just introduced half of the vocab and then directly started with half of the text that would use it. Thats much better than teaching all the vocabs directly at the beginning. While introducing the vocabulary word for word in Chinese, we would always directly have to make use of the new learned words, like for example in a role play with the neighbour. So it is everything but ex-cathedra teaching, it is really interactive and involves a lot of speaking. The teacher of course uses Chinese to explain the words and to my surprise that works much better than I thought. Reading the text is much like you would expect it to be. After we all read the text and understood its meaning (again, she explains every sentence in Chinese), we have another role play and try to make use of all the new words and phrases that were introduced in the text. So there is a lot of Chinese speaking in the class, obviously. But the good thing is that we don't just stick to the book and do all the exercises one after another, what also could be done at home and would be rather boring. No, the course is very lively and full of discussions in Chinese. Sometimes we completely get side-tracked and for example talk about that earthquake that happened the day before, or the funny maps that I mentioned. And I tell you, this class is filled with laughter the whole 2 hours which is just good. For me this is the perfect playground to use my Chinese. Here I can really try to express myself and even directly get corrected if I make a mistake. I wouldn't feel so easy with that "trying" out on the streets. Here I can just start to talk and doing so gives me confidence with my Chinese. A confidence that I would never gain with just reading the book at home on my own. Concerning the extra work, that you would have to do at home, I would say you are done with not more than one hour. We didn't get other homework than study the characters and the vocab, so that was really okay. If you consider taking this class and wonder if you still have enough time to earn money next to your course: you can. I am managing to write my master thesis in Information Technology next to this course and I feel there is no problem at all. Have a good weekend out there! Yes! Now I am sure and with all confidence I can say: I will speak Chinese! But my first positive impressions are not just influenced by this personal emotions. Let me tell you why I really like this course. Of course, the two most important factors for a good course are the teacher and your classmates. And both are really good. I was lucky. My Chinese teacher is a very very lively and cheerful woman. She teaches with such a passion, it even gives me more motivation than I already had, and as you might have already found out by reading my blog...I already had a lot of motivation on my own. She makes us talk a lot, which is great. Another good thing is that her pace of speaking perfectly resembles that of a normal Taiwanese person here. She doesn't try to speak extra slow to make it easier for us to understand. No, she wants to make us get used to the normal speed of conversation, and in my opinion that is just right. Of course we can always ask her to explain again what she just said, and she will do it. My classmates. I am the only westerner in my class and that is great. I am really happy about that. The great thing about that is that I don't chat in English with my new classmates all the time. Instead, we use Chinese to talk to each other. It is rewarding to see that I can have a conversation in Chinese with somebody else who is also studying Chinese. It is like we can directly try what we have learned so far and to see that it is working in real life is just rewarding, to repeat myself. :) Also it is kind of funny when you see a German guy talking to a Japanese....in Chinese! Well, and this happens here everyday. Wonderful. International understanding at its best! My class has 8 people, including myself. So I really like them all, and we have a great deal of fun together. Moreover, we really just speak Chinese (My colonial friend is an exception). We all sit around that table which makes it very easy to communcate whith each other. On the second day we actually moved to a bigger room that has two tables of the same kind. I first thought I would prefer the smaller one because it felt so cosy and not like a classroom at all, but at the end of the second lesson I was already fine with the bigger one. The flag of Taiwan and the flag of the United nations...read more about that on Mark's blog. So much on my first impressions! Thanks for reading so far and stay tuned! Exciting times! Yesterday I had the orientation and welcome session at Shida University and in a couple of hours I will have my first Chinese class there! So let me tell you about my impressions on the orientation session. It was scheduled from 9 to 11 a.m. and I arrived around 8:45. Once I stepped out of the elevator in the 5th floor, I was given a student's guidebook and I was told where to attend the orientation session. The whole orientation took place in the same lecture hall where my oral examination for the placement test took place. And at 9 o'clock, every single seat was taken, the whole lecture hall was completely filled up with new students. Yes, that definetly is the largest Chinese program in Taiwan! Around 300 new students from all over the world start with me in this semester, and they have an overall of 1500 Chinese language students at Shida by now. To my surprise, most of the new students where Asian. I really did not expect that, I thought there would be more westerners. But actually I think that will be an advantage later in class. I wouldn't be too happy to chat with my western classmates in English all the time, I am sure it will be interesting to have to use Chinese for talking to your classmates, because you are forced to - since their English might not be so good. Looking forward. At 9 o'clock sharp the president of the Mandarin Training Center at Shida entered the stage and delivered a very warm welcome speech. After that, another female Shida staff member entered the stage and gave us a powerpoint presentation where she summarized the most important facts about the visa, the courses, changing the courses and just about anything that we are supposed to know. What really surprised me was the fact, that she did her presentation in both, English and Chinese. The whole time when she spoke Mandarin I wondered why she would do that, because I am sure that she pretty much was talking to herself because no one understood her. If we would have understood her, we would basically not have to go to a Chinese language school! ;) I really have to ask her about that sometime! (Or perhaps she even reads this here! Hello!! ;) If you have an idea about that, let me know. After a question session, we could pic up our class schedule. Unfortunately, there I had a little of a surprise. The timeslot that I chose was correct, from 6 to 8pm, but the level did not match with the level that was previously evaluated in the placement test. According to that class schedule, I should take a class that starts with the beginning of the first PAVC book. Hm, that was bad, because I was told I could directly start with the 2nd book. So I went back to the question and answer session that was not yet finished and asked the staff member that had given the powerpoint presentation about it. She told me that I should first attend the wrong class and then follow a (complicated) changing of class procedure in the change class period, involving filling out forms, talking with the teachers and so on. I am happy that I did not take this advice but directly went to the main office, counter 7, to resolve that problem immediately. The staff member there was very friendly and helpful just that she encouraged me to deliver my request in Chinese language instead of English. Well, if I would have had the choice, I would have chosen German instead. Haha, but anyways, as it turned out, they didn't give me the more advanced class because there was no advanced class in the timeslot that I had chosen. Anyways, she also didn't really know why they would give me that beginner class instead then. I told her that it was okay for me to take an 8 a.m class as well, and the whole issue was resolved. :) (Actually it must have looked really funny seeing me and talking about administrative stuff in Chinse...)Now it is 6:30 a.m in the morning and in 1,5 hours I will have my first class of Chinese at Shida, starting from chapter 23 in the first book, which is really okay for me since the first book just has 25 chapters. Stay tuned for me...it has begun! Perhaps you are just about to decide where to study Chinese. There are several great options, but in the end you will have to decide if you prefer to study in mainland China or if you go to Taiwan. With these two options also comes the decision on whether you want to learn the traditional Chinese characters as used in Hong Kong and Taiwan (and to a lesser extent also still in mainland China) or the simplified characters as widely used in mainland China since the 1950s. There have been so many discussions before on what would be the better choice, study the traditional characters or the simplified ones. I can just give you my personal point of view, since I studied both, the simplified ones in Singapore and now the traditional ones in Taiwan. So I really know what I am talking about. You might think: Taiwan is such a perfect choice for studying Chinese, their pronounciation of Mandarin sounds so pure and clear, and the environment is just right. But why, yeah WHY do they teach traditonal characters? This is exactly what I thought when I first came to Taiwan in the scope of my Information Technology studies and considered to take Mandarin courses here in the future. I thought it would be a waste of time to study these even more complicated characters which would even prove to be completely useless in mainland China. Also, I could remember my two semesters of Chinese in Singapore, and how glad I was to study the simplified characters compared to the traditional ones. I used the wonderful website www.zhongwen.com to study the characters and to find the correct character was always not so easy since the website indexed the characters by their traditional version and just showed the simplified version after you had already found the traditional one. Boy, was I happy to study the simplified ones, the traditional ones just looked super complicated, impossible to ever master. I was sure it would be easier to study the simplified ones and it was a mystery to me why the website indexed the characters using the traditional characters. That was long ago in 2003. In the meantime I lived both in Hong Kong and Taiwan for at least a semester and was exposed to traditional characters at a large extent. Now that I not only was exposed to the characters, but also studied them for quite a while now, my perception in that matter completely changed. Let me tell you why that is the case. As you can see, the character has not just been simplified but at the same time it unfortunately has been uglified. I could go on and on. Whenever I see a simplified text nowadays, the first reaction that pops up on my mind is "wow, that really does not look any good at all!" (to say it in a polite way). Anyways, if you are interested in calligraphy and might think about trying some on your own in the future, there is also no other way than to study traditional characters, since obviously nobody would use the simplified characters for writing beautiful. So much for the esthetic reasons why I prefer the traditional characters. Let's move on to the more practical ones. How hard is it to study those complicated traditional characters compared to the simplified ones? As I mentioned before, I studied simplified ones before and thought it must be so hard to learn the traditional ones. I was wrong. Even more surprising: I find it easier to study and remember the traditional ones! Let me explain why. 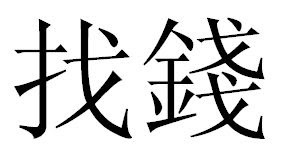 The left part of the character means "ear" and the right part of the character depicts "virtue". Together that becomes "to listen". So an ear learning virtue becomes "to listen"! I find this fantastic and whenever I learn such interrelations between characters forming new ones, it makes me happy because I also learn about the Chinese culture! From this character there is nothing insightful about the Chinese culture or what ancient Chinese related to "to listen". There is no interesting story that you can make up for yourself to remember the character better. But you might say, this character is much much easier to remember, since it is so much easier to write. I tell you, you are mistaken. After you have studied hundreds of different characters, and you have to remember how to write "to listen", you will be more than happy that you can easily remember that it is constructed by "ear" and "virtue". No such crib for the simplified one, that would be that logic and teaches you about Chinese culture at the same time. Another big advantage that traditional characters have when compared to their simplified counterparts is that they are easier to distinguish between. That is due to the fact that they in general have more strokes. And with more strokes you can make characters look more distinguisable from each other. 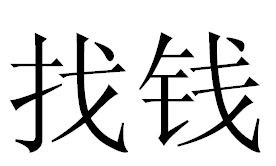 Simplified characters us much less strokes, so they tend to look more alike than the traditional ones. And therefore they are easier to be mistaken for one another. Not so easy anymore, right? The stroke count is nearly the same, as is the whole look of these two characters in general. Easily to be confused. And this was just one example, many more could be given. So, if anybody tells me that the simplified characters are so much more easy to learn, now you know why I would disagree with that person. Totally disagree. But still, since for me learning a language means also learning more about the culture of a country, the main reason why I am so happy that I have the chance to study the traditional characters is that they are so full of meaning that has not been stripped away in the process of simplification. So what are my goals that I want to attain? My long-time goal is to be fluent in Chinese. And with fluent I mean perfectly fluent, indistinguishable from a native speaker. I know, that is a very very ambitious goal and we might be talking about decades to pass until that stage is reached. ;) However, why not set yourself hard to reach goals, you will be even more happy if you do achieve them. Studying Chinese makes me happy, or to be more concrete, seeing the progress that I make with studying the Chinese language and being able to understand more and more. It is a wonderful feeling to walk the streets of Taipei and recognize more and more of the Chinese characters that before just seemed to be impossible to ever read, not to mention write. It makes me feel more close to this culture that I admire so much. Therfore I feel very happy and blessed to have the chance to be in this country. And believe me, Taiwanese people are so friendly, I always felt so welcome here. I admit, this would have been more impressive, if I wouln't just have worked through the first book already. But still, due to the gaps this is not readable at all! As I learn more and more characters, I will always update this picture, fill the gaps and post the new version here on my blog. 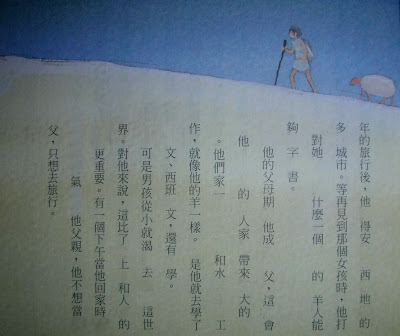 "The Alchemist" uses a very easy language, so I think this book is a very good first approach to reading a Chinese book. So I had my placement test at Shida last tuesday. I had four timeslots to choose from, and I chose the last one to show up there which was last tuesday from 2 to 4pm. I just thought this would be the least crowded one and I guess I was right. The placement test consisted of two parts. First was the oral interview and second a computer based multiple choice test. As you can imagine, the oral interview part was the one that made me much more nervous! 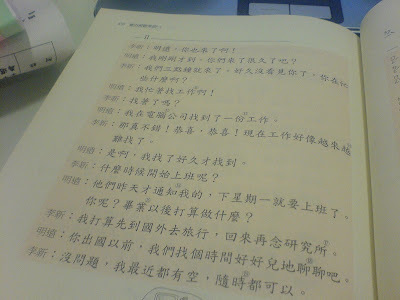 Being interrogated by a Chinese teacher...in Chinese....ahhhh! Oh my god...! But let me tell you about my first impression of Shida. I found the registration procedure and the subsequent placement test to be extremely well organised and professional. You could tell that they have years and years of experience. Everything just went fine, without any moments where you ask yourself: what to do now, where to go and so on. Just fine. And since I really had studied the contents of the whole book, I could flawlessly read out the whole page. After that she was obviously satisfied and asked me if I directly wanted to start with the second book. Damn was I happy! She even asked me if I wanted to skip the multiple-choice test. But since I studied so hard for everthing, I also wanted to take it. So the oral examination was a full success! Yeah, that was about my successful placement test. Next monday will be the orientation session, where they will tell us everything about the Mandarin Training Center and where I will get to know my fellow students! I am very much looking forward to that! Still reading? Haha, okay, you must either know me in person or you are really interested in this Chinese language program. Okay, let me tell you a bit about my background and why I chose Shida. Asia had always fascinated me. Every aspect of it, the cultural diversity, the languages, the food...you name it. This might also be due to my personal roots. I am half German, half Chinese. My father is an overseas Chinese from Indonesia. Well, he went to Germany to study and met my mother. The result is a blog about the Shida language program 28 years later...haha! :) Unfortunately, my father's family lost the ability to speak the Chinese language since they had already been in Indonesia for some generations. So I grew up as a normal German child is supposed to. ;) No Chinese language at all. And as you often find it with mixed folks...we are looking for our roots. During my studies I tried to go abroad to Asia as often as possible. I studied (and still study) Information Technology, and in the scope of this study I went to Singapore, Hongkong and Taiwan. I don't go into detail with it now, I can just tell you it was great and changed my life... :) Now I am just about to graduate, and I am writing my master thesis here in Taiwan at the National Taiwan University. Now you know a bit more about me. You can order it here: http://www.ccbc.com.tw. You cannot go wrong with it, it is widely being used here as I said before and it is the perfect material if you want to prepare for your studies here. There are also some supplemental material like CDs and VCDs that can help you with the pronounciation, but I haven't checked them yet. So why did I choose Shida? Well, it is the biggest Chinese language program here. Of course, this doesn't say that it is the best. But from what I heard it is pretty decent. Most of the blogs I read said good things about it. They offer a lot of courses, also in different time slots, which was very important for me since I am also writing my master thesis here and I would like to take either an evening class or a class very early in the morning, so I would have time within the day to write my master thesis. Yeah, so the Shida language course has a good reputation. However, the best Chinese course is said to be the course that the National Taiwan University (NTU, Taida) offers, the university where I write my Information Technology master thesis. Unfortunately it comes with a price tag that is ridiculously high, at least for a someone like me. The NTU program will set you back around 2600 €uro (two thousand six hundred €uro) for a 3 month course! The Shida 3 month course will cost you around 500 €uros, so taking into account that Shida is also not really far away from my apartment and my NTU office, I chose the Shida program. Okay, that should be enough for a first entry. Stay tuned and soon more here from Taipei!